We have a large selection of elegant shower and bathtub accessories that will add a touch of style and elegance to any bathroom. 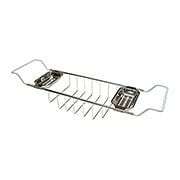 Add a convenient wire rack to your clawfoot tub, or an attractive hanging organizing rack to your shower, and make your bathroom shine. Complete the vintage look of your clawfoot tub with our classic, riser mount soap basket. This sturdy organizer is made of quality solid brass, and comes in your choice of three lustrous tarnish and corrosion-resistant finishes. It's the perfect solution to help keep your bath essentials organized and at your fingertips. 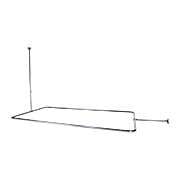 Complete the vintage look of your clawfoot tub with our classic adjustable shelf. This sturdy organizer is made of quality solid brass, and comes in your choice of four lustrous tarnish and corrosion-resistant finishes. It's the perfect solution to help keep your bath essentials organized and at your fingertips. Complete the vintage look of your clawfoot tub with our classic, over rim 8-inch soap basket. This sturdy organizer is made of quality solid brass, and comes in your choice of four lustrous tarnish and corrosion-resistant finishes. It's the perfect solution to help keep your bath essentials organized and at your fingertips. Complete the vintage look of your clawfoot tub with our classic, over rim 7-inch soap basket. This sturdy organizer is made of quality solid brass, and comes in your choice of two lustrous tarnish and corrosion-resistant finishes. It's the perfect solution to help keep your bath essentials organized and at your fingertips. 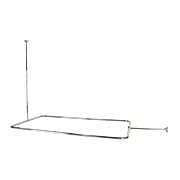 Rectangular Clawfoot/Freestanding Tub Enclosure - 57" X 31"
Turn your freestanding or clawfoot tub into a shower with our convenient Rectangular Enclosure (57-Inch x 31-Inch). Designed for long-lasting wear, it is constructed of durable brass tubing and comes in an array of popular finishes. Easy to install, it comes complete with wall and ceiling braces. Side Mount Clawfoot/Freestanding Tub Shower Enclosure - 57" X 31"
Turn your freestanding or clawfoot tub into a shower with our sturdy rectangular enclosure. Designed for long-lasting wear, it is constructed of durable brass tubing, and comes in an array of popular finishes. Easy to install, it comes complete with wall and ceiling braces. 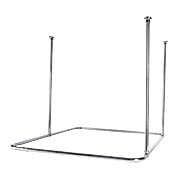 Rectangular Clawfoot/Freestanding Tub Enclosure - 45" X 25"
Turn your freestanding or clawfoot tub into a shower with our convenient Rectangular Enclosure (45-Inch x 25-Inch). Designed for long-lasting wear, it is constructed of durable brass tubing and comes in an array of popular finishes. Easy to install, it comes complete with wall and ceiling braces. Circular Clawfoot/Freestanding Tub Shower Enclosure - 32"
Turn your freestanding or clawfoot tub into a shower with our convenient circular enclosure. Designed for long-lasting wear, it is made of durable brass tubing and comes in an array of popular finishes. Easy to install, it comes complete with wall and ceiling braces. Square Clawfoot/Freestanding Tub Shower Enclosure - 42"
Turn your freestanding or clawfoot tub into a shower with our convenient square enclosure. Designed for long-lasting wear, it is made of durable brass tubing and comes in an array of popular finishes. Easy to install, it comes complete with wall and ceiling braces. 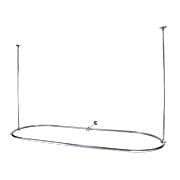 Oval Clawfoot/Freestanding Tub Shower Enclosure - 72" X 32"
Turn your freestanding or clawfoot tub into a shower with our convenient Oval Enclosure (72-Inch x 32-Inch). Designed for long-lasting wear, it is constructed of durable brass tubing and comes in an array of popular finishes. Easy to install, it comes complete with wall and ceiling braces. 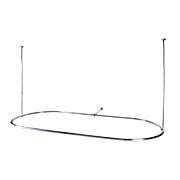 Oval Clawfoot/Freestanding Tub Shower Enclosure - 58" X 24"
Turn your freestanding or clawfoot tub into a shower with our convenient Oval Enclosure (58-Inch x 24-Inch). Designed for long-lasting wear, it is constructed of durable brass tubing and comes in an array of popular finishes. Easy to install, it comes complete with wall and ceiling braces. Timeless and versatile, our Premium Adjustable Tub Basket is a great choice for any bath. 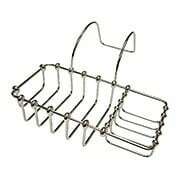 This sturdy organizer is made of stainless steel, and comes in an eye-catching finish. 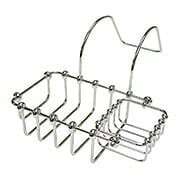 It is the perfect solution to help keep your bath essentials organized and at your fingertips. Manufactured by Gatco. The Exton 8-Inch Shower Corner Shelf provides ample space for your necessities. Made of durable stainless steel, this space saving accent features a sleek design, protective railing, and slots for drainage. A fully concealed mounting application offers a polished look that can be installed in minutes! Manufactured by Gatco. 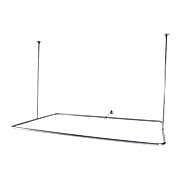 The Exton 11-Inch Shower Corner Shelf provides ample space for your necessities. 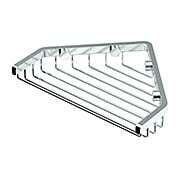 Made of durable stainless steel, this space saving accent features a sleek design, protective railing, and slots for drainage. A fully concealed mounting application offers a polished look that can be installed in minutes! Manufactured by Gatco. 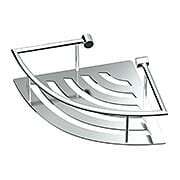 The Exton 19-Inch Horizontal Shower Shelf provides ample space for your necessities. Made of durable stainless steel, this space saving accent features a sleek design with rounded edges and slots for drainage. A fully concealed mounting application offers a polished look that can be installed in minutes! Manufactured by Gatco. 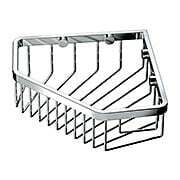 The Exton Corner Shelf provides ample space for your shower necessities. Made of durable stainless steel, this space saving accent features a sleek design with rounded edges and slots for drainage. A fully concealed mounting application offers a polished look that can be installed in minutes! Manufactured by Gatco. 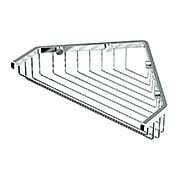 The Exton 10-Inch Horizontal Shower Shelf provides ample space for your necessities. Made of durable stainless steel, this space saving accent features a sleek design with rounded edges and slots for drainage. A fully concealed mounting application offers a polished look that can be installed in minutes! Manufactured by Gatco. Our 7-Inch Shower Corner Basket provides ample space for your necessities. 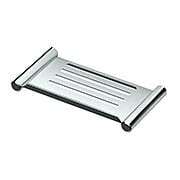 Made of durable stainless steel, this space saving accent features a traditional design and slots for drainage. A fully concealed mounting application offers a polished look that can be installed in minutes! Manufactured by Gatco. 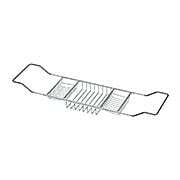 Our 9 1/4-Inch Shower Corner Basket provides ample space for your necessities. 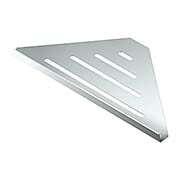 Made of durable stainless steel, this space saving accent features a traditional design and slots for drainage. A fully concealed mounting application offers a polished look that can be installed in minutes! Manufactured by Gatco. 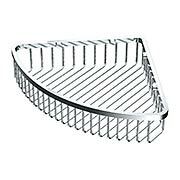 Our 8 1/2-Inch Shower Corner Basket provides ample space for your necessities. 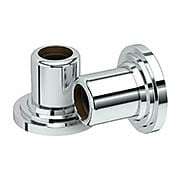 Made of durable stainless steel, this space saving accent features a traditional design and slots for drainage. A fully concealed mounting application offers a polished look that can be installed in minutes! Manufactured by Gatco. Our 12-Inch Shower Corner Basket provides ample space for your necessities. 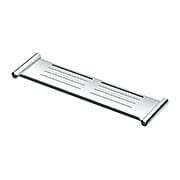 Made of durable stainless steel, this space saving accent features a traditional design and slots for drainage. 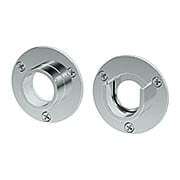 A fully concealed mounting application offers a polished look that can be installed in minutes! Manufactured by Gatco. 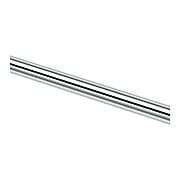 Our Universal Shower Rod is a high-quality essential. Made of solid brass, it comes in two gleaming finishes and is ideal for any decor, from traditional to contemporary. Manufactured by Gatco. 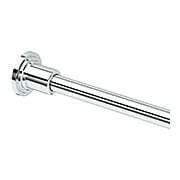 Our Marina Shower Curtain Rod Ends bring stylish convenience to your bath. Made of solid brass, they feature a crisp, stepped design and come in two gleaming finishes. Ideal for a variety of decors, from traditional to contemporary. Manufactured by Gatco. 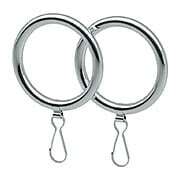 Our Solid-Brass Round Shower Curtain Rings are high-quality essentials. They come in an array of popular finishes are ideal for any decor, from traditional to contemporary. Manufactured by Gatco. 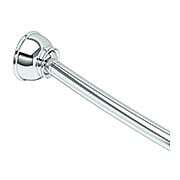 Our Tiara Shower Curtain Rod Ends bring stylish convenience to your bath. Made of solid brass, they feature a crisp, clean design and come in two gleaming finishes. Ideal for a variety of decors, from traditional to contemporary. Manufactured by Gatco. 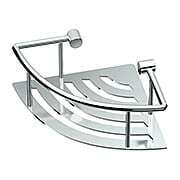 Our Shower Curtain Rod Mounting Brackets bring stylish convenience to your bath. Made of solid brass, they feature a crisp, minimal design and come in two gleaming finishes. Ideal for a variety of decors, from traditional to contemporary. Manufactured by Gatco. Our Marina Shower Curtain Rod Set bring stylish convenience to your bath. Made of durable solid brass, it features stylish brackets with a crisp, stepped design. From traditional to contemporary, it is ideal for a variety of interiors and comes in an array of popular finishes. Rings sold separately. Manufactured by Gatco. 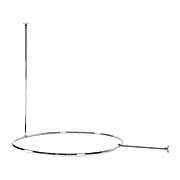 Our Curved Shower Curtain Rod Set bring stylish convenience to your bath. Made of durable solid brass, it features traditional brackets and comes in two finishes. Ideal for a variety of interiors. Manufactured by Gatco. 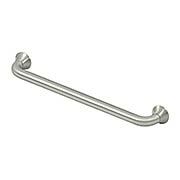 The simple design of the our 24-Inch Grab Bar brings added safety and a clean look to modern bathrooms. Constructed from solid brass, this sturdy accessory comes in an array of popular finish options. 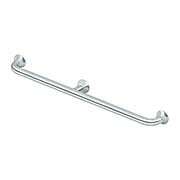 The simple design of the our 36-Inch Grab Bar brings added safety and a clean look to modern bathrooms. Constructed from solid brass, this sturdy accessory comes in an array of popular finish options.